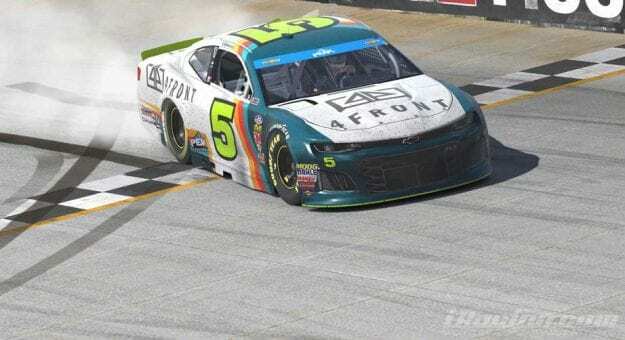 Michael Conti made his second visit to Victory Lane in the 2018 NASCAR PEAK Antifreeze iRacing Series, taking the checkered flag at Dover International Speedway to wrap up the first round of the playoffs. Conti led 79 of 200 laps and beat championship competitor Ryan Luza by 3.1 seconds. Fellow playoff driver Bobby Zalenski was third but failed to advance into the Championship 4. Michael Guest finished fourth, the highest finishing non-playoff driver. Nick Ottinger rounded out the top five and he, too, fell just short of making the finale. The final four contenders are set heading into the championship race, headlined by three former series champions. Conti, with two wins and the 2014 championship under his belt, comes in as the favorite with his first-round performance. However, he will face tough competition from last year’s champion Luza and three-time champion Ray Alfalla. Matt Bussa, the underdog of the group, has his first shot at a title. At Dover, Corey Vincent captured his first pole of the season but led only six laps before losing the lead on pit road under the first caution flag. Zack Novak decided to stay out since only a handful of laps were run and assumed the lead. On the restart both Conti and outside polesitter Keegan Leahy got the jump on Vincent, dropping him to fourth. Novak could hold the lead for only three laps after the restart before Leahy motored around him, bringing Conti along as well. The duo looked to check out on the field as the field strung out. The race would go green until Lap 51 when Novak got together with Timmy Hill and crashed, bringing out the second yellow flag of the evening. The caution drew the leaders into the pits for service with Leahy’s crew holding serve, returning him to the track in the lead. Leahy looked to have the better short run car as he quickly gapped Conti on the restart. Conti, however, had the speed on the long run and by Lap 90 was filling up Leahy’s rearview mirror. Passing Leahy proved difficult, though, and Conti’s attempt was interrupted by the third and final caution flying on Lap 98 for Taylor Hurst’s crash on the backstretch.